Spies, Lies, and Allies Book Release Fun! Get your nerd on and join tons of fun presenters at Denver Pop Culture Con! 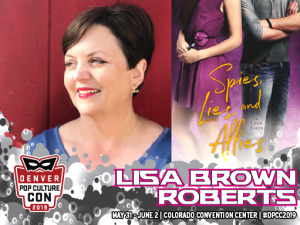 Jul, 08: Meet Four YA Authors! Denise: Oh, I love it! I have to say, the writing is pretty good in spots. You definitely followed your talent! © 2014-2019 Lisa Brown Roberts. All rights reserved.